World leaders addressed the UN climate summit that kicked off in Paris Monday, with US President Barack Obama calling the summit a “turning point” in global effort to limit worldwide temperature rises. That limit, negotiators hope, will arrest global warming at no more than 2 degrees Celsius over pre-industrial levels by the end of the century. The conference begins in the dark shadow of the attacks that ripped through Paris little more than two weeks ago, killing 130 and injuring another 352. 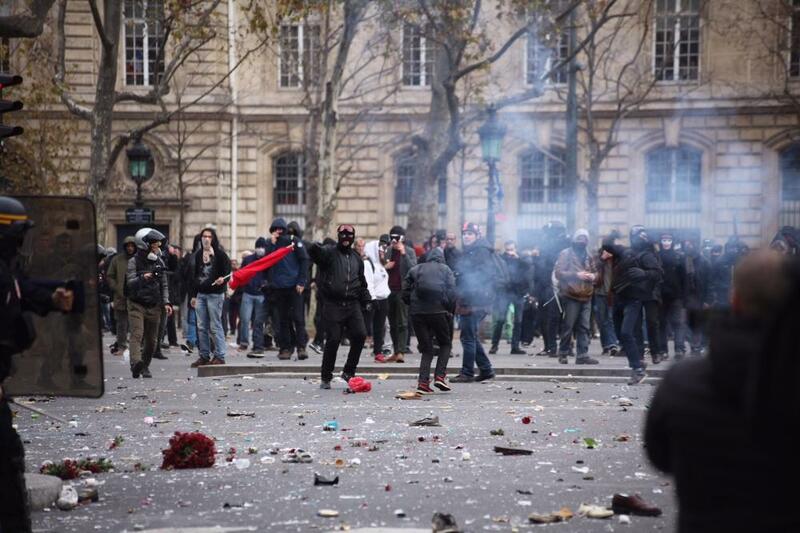 Security is tight, with 10,800 extra police deployed throughout the French capitol, and a general ban has been placed on demonstrations and marches. The new measures have not come without clashes. 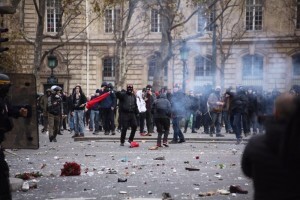 Some 200 people were arrested for demonstrating on the city’s Place de la République Sunday, where a march was met with tear gas canisters fired by police. For Hauge, that means promoting the vast array of climate technologies that have become cheaper, and, if used in sufficient quantities and in harmony, would lead in several years time to not just cuts in carbon, but negative carbon output. “Working toward something like that – even if it doesn’t get achieved – would be a fitting way to honor the battles that have brought this city and the world community together,” Hauge said. Obama used his speech to more than 150 world leaders Monday morning to salute Paris and its people for “insisting this crucial conference go on” after the attacks. “What greater rejection of those who would tear down our world than martialing our best efforts to save it,” Obama said. 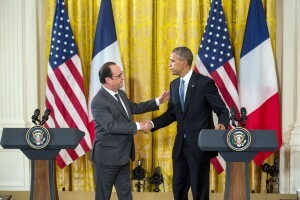 A somber French President Francoise Hollande made that connection as well, linking the issues of climate change with terrorism. He told the audience that we must not just leave our children a world free of terror – we owe them a viable planet as well. The last major climate meeting in 2009 in Copenhagen ended in failure. 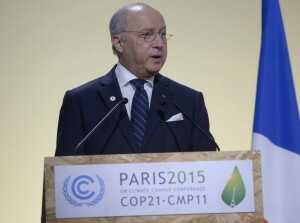 But French Foreign Minister Laurent Fabius, who is chairing the Paris meeting, said a deal was within reach. Obama also announced a 20-billion-dollar-a-year clean technology initiative involving governments and entrepreneurs such as Microsoft’s Bill Gates and Facebook’s Mark Zuckerberg. Bellona President Hauge said the outcome of an early morning meeting between Xi and Obama could prove one of the more critical accords early in the talks. Hauge said US and Chinese leadership had worked hard to push 180 nations to make their own pledges to curb emissions in the run-up to the Paris talks and commit to periodic verifications. But, even with the draft commitments submitted – and subject to two weeks of debate – Hauge noted that they’re still overshooting the 2.0 degree Celsius worldwide temperature rise the Paris meeting hopes to avoid. 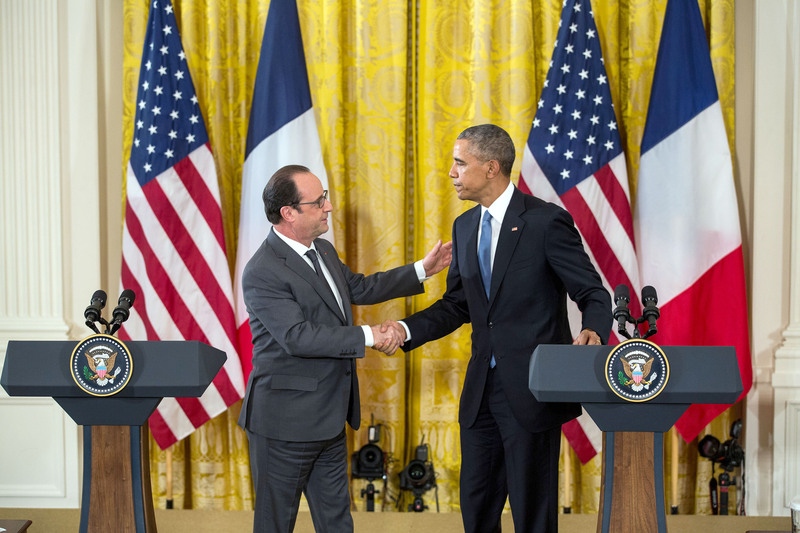 Obama, in his extensive pre-Paris stump tour of the US Arctic to highlight the effects of climate change at home, introduced the idea that the world’s nations be held to checks every five years to evaluate their efforts toward reducing the impact of climate change. Hauge said that notion is gaining traction among delegates in the first few hours of the 12-day meeting, and added he was “slightly optimistic” that the conference would produce some kind of verification system. But he said waiting five years between these checkups “is a path to Armageddon” and that individual countries’ efforts must be reevaluated each 2 years to be meaningful because each country has a different idea about how to reach it’s commitments. “Otherwise, Paris will end up in the rut of trying to keep temperature rises to 2.7 to 4 degrees Celsius, and that would be pointless,” said Hauge. Bellona’s NGO observers in Paris will work to present solutions that will keep temperature rises to 2 degrees, if not below, with the use of mass deployed technology, which Hauge noted was already proving its worth. One of these, which had proved stutter-step even in the climate-friendly European Union, is Carbon Capture and Storage, or CCS, technology. Pushing the CCS agenda in Paris may be challenging in light of British Prime Minister David Cameron’s gutting of the UK’s £1 billion (€1.4 billion) CCS programs in favor of new nuclear projects, a direction Hauge said numerous countries were planning to propose – but which also take decades and tens of billions of Euro to realize. “Cameron is taking a dangerous track – favoring nuclear over CCS leaves him with little credibility,” said Hauge, adding that nuclear plant expansions and possible accidents and dumping in England endanger fishing grounds that are Norway’s breadbasket. 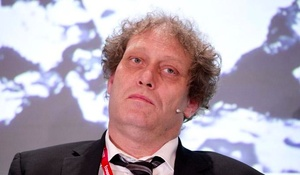 Keith Whiriskey, project manager for climate technologies with Bellona Europa, said even the UNs Intergovernmental Panel on Climate Change, or IPCC, has asserted that reaching the 2 degree Celsius goal is impossible without CCS. CCS, like many other renewable and climate friendly technologies, is dropping in cost. 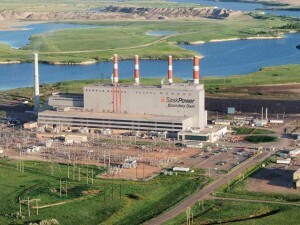 The Boundary Dam CCS unit in Saskatchewan, Canada, which opened in 2014, has trapped around 1 million tons of coal-produces CO2, or the equivalent of taking 250,000 cars off the road. 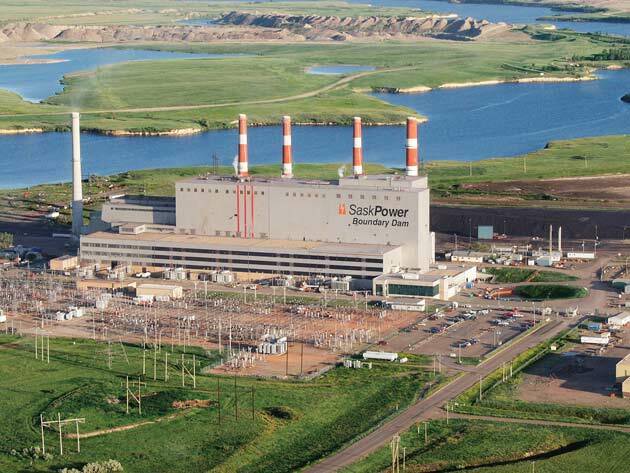 SaskPower, which initiated the first-ever industrial-scale CCS facility for a cost of €1 billion, now says its next project will cost 30 percent less. Whiriskey noted that CCS must be envisioned for projects further afield than reducing CO2 output from coal-fired power plants. He said its inclusion in industrial production sites and gas refineries would encourage Paris negotiators to think in terms of actually going carbon negative. Hauge said he would push further carbon negative energy production ideas, such as biomass that doesn’t interfere with agriculture. And, he said that renewables across the board –most notably solar panels and electric cars – had dropped precipitously since the 2009’s Copenhagen climate summit. He added that if fossil fuel subsidies worldwide are about five times the subsidies granted by governments to renewable energy development. “Cutting these subsides and rechanneling them into renewable energy and infrastructure would make opting for climate friendly technologies even easier,” he said.